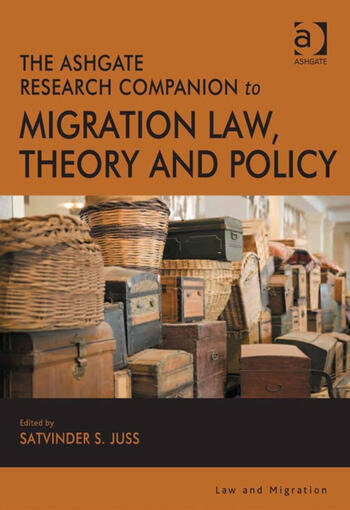 The Ashgate Research Companion to Migration Law, Theory and Policy complements the already successful Ashgate series Law & Migration, established in 2006 which now has a number of well-regarded monographs to its credit. The purpose of this Companion is to augment that Series, by taking stock of the current state of literature on migration law, theory and policy, and to sketch out the contours of its future long-term development, in what is now a vastly expanded research agenda. The Companion provides readers with a definitive and dependable state-of-art review of current research in each of the chosen areas that is all-embracing and all-inclusive of its subject-matter. The chapters focus on the regional and the sub-regional, as well as the national and the global. In so doing, they aim to give a snap-shot that is contextual, coherent, and comprehensive. The contributors are both world-renowned scholars and newer voices and include scholars, practitioners, former judges and researchers and policy-makers who are currently working for international organisations. Satvinder S. Juss Ph.D (Cantab) FRSA, teaches international refugee law and human rights law at King's College London, UK, where he is also the Director for the Centre for Transnational Law, and a former Human Rights Fellow of Harvard Law School. He is a Barrister-at-Law of Gray's Inn, who has appeared in human rights cases in the Supreme Court, the House of Lords, and the Privy Council. He has acted as an expert on human rights issues for various think-tanks such as Encounter, Rowntrees Trust, the Royal Society of Arts, the International Organisation for Migration, and lately the Centre for Social Justice, where he is currently engaged in a landmark inquiry into human trafficking and slavery. Professor Juss was the British Expert at the 2nd Conference of Ministers of Justice on the EU Rule of Law Initiative for Central Asia in Tajikistan in 2010, and seeks to combine the roles of teacher, practitioner, and activist in policy-oriented work.